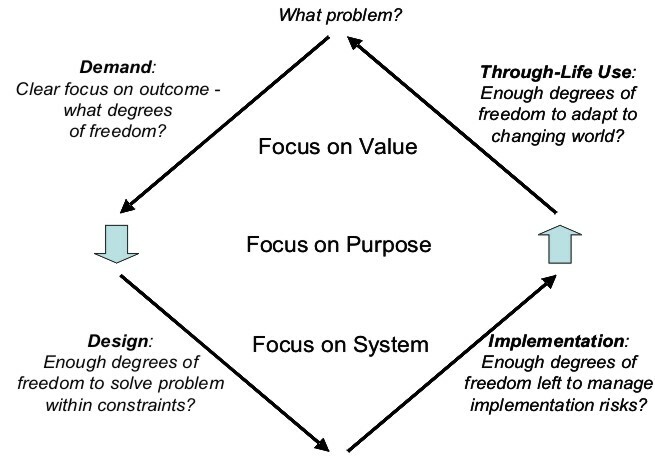 Work within INCOSE by Jack Ring and others on ‘Intelligent Systems Engineering’ makes this ‘V’ the lower part of a System Value Cycle that seeks to align its focus on System with an upper inverted ‘V’ focused on Value with the problem to be addressed at its apex, and the relationship between the two ‘V’s focusing on Purpose. In our terms, the bottom ‘V’ is about designing a structure-determined system (of systems), while the top ‘V’ describes the structure-determining processes by which such a system is itself composed with other systems to useful ends. Each of these questions relate to different constituencies with differing vested interests in how they are answered. How, then, is this cycle to be managed as a whole? What happens if we approach this cycle not from the point of view of the systems, but from the point of view of the demands? As long as the problem remains a generic one based on symmetric assumptions about the nature of demand, the top ‘V can be addressed independently of the bottom ‘V’. But as soon as the demand situation is such that the demands emerging from it are necessarily asymmetric and dynamic (as described here), this is no longer possible – the systems have to be understood as more than socio-technical, and it becomes necessary to model the structure-determining as well as the structure-determined processes. In education, with the through-life management of the responses to individual children’s needs. TLCM is an emerging form of asymmetric governance. Previous PostStrategy-at-the-edgeNext PostWhy is a stratification not a universal hierarchy?